Every once in a while I wish you could smell the scents coming from the kitchen, this is one of those times. Super selective smell-o-vision, like a nice flower, forest smells, or organic coconut flour right out of the bag. Any of those would be so lovely. When I was testing this recipe over the last month, I thought that every single time I opened the bag of coconut flour to make the crust. It smells like fresh ground coconuts, which is so amazing. Honestly, make these for that reason alone! Yes, that dark chocolate cream cheese filling is something to love on it’s own, but it’s turns into extra good chocolate filling with the toasty coconut flavor of the crust. I made this intentionally with very little sugar, I only added honey to sweeten the crust a touch, but kept the filling sweetened only by the dark chocolate. But the fat from the sour cream and cream cheese, with a touch of salt, and dark chocolate make it creamy and perfectly subtly sweet. I am paying attention to how much sugar goes in things, and there are places to have more sugar, like cake of course. But if I can get away with less sugar and equally delicious flavor, why not?! For me, it’s about getting my taste buds to change and eating less sugar is healthy, so I’m all for it. It’s funny because I already use way less sugar than most recipes call for, but I’ve found that I can use way way less now, and food can be naturally sweet and tasty. This recipe was a great place to start, and it worked out so well! I love a darker chocolate anyhow, which is naturally better for us, so it was a win win when I tested it this way and it turned out exactly how I wanted. A funny thing about it all is that I am a professionally trained pastry chef and baker. Naturally we made things with lots of sugar. As the years go by after working in bakeries, my taste buds have changed and I adjust to that. Sugar aside, totally more random… I have a funny time with straight lines. So when I was in culinary school my chef instructors would lovingly laugh hysterically because none of my lines would be straight. For example, when you cut the dough to make croissants, it needs to be straight. Mine never were, even using rulers. And to be honest it doesn’t totally surprise me, I am kind of a color outside the lines kind of a woman. So it was fitting that I didn’t really take the time to make my lines straight. I know if I applied myself and took an abundance of time they’d be straight. But I was more into making the food perfect, maybe not the shape :). If you look closely, you’ll see the bars are all cut on a slant lol!!! I love making food, decorating and making straight lines, not so much. 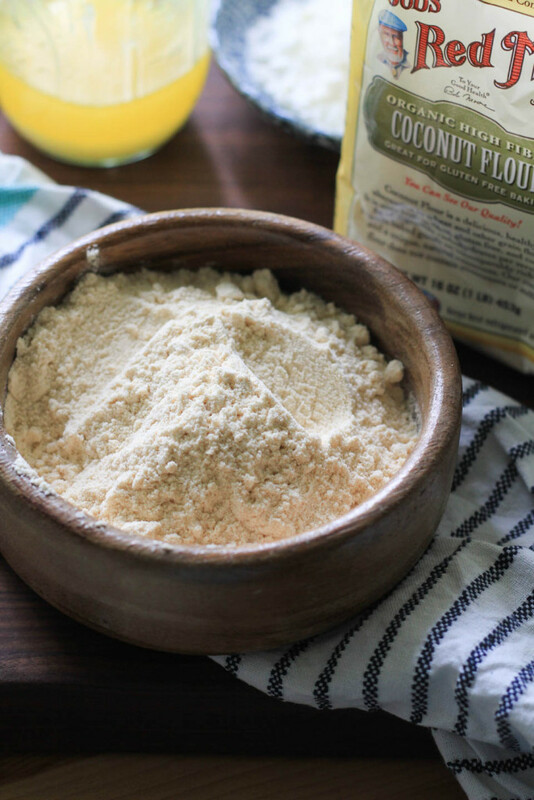 Place coconut flour and salt in a large bowl, whisk to combine. Stir in melted butter and honey using a spatula. Spray/oil an 8×8 oven safe pan. Press crumbs into pan firmly to form crust. Place in oven for 15 minutes. Remove and allow to cool for 5 minutes. While crust bakes, add cream cheese to a stand mixer fitted with paddle attachment or use hand mixer, mix on medium high for 4 minutes, until creamy and fluffy. Add sour cream, melted chocolate (careful it’s not hot), and salt. Mix on medium to combine. 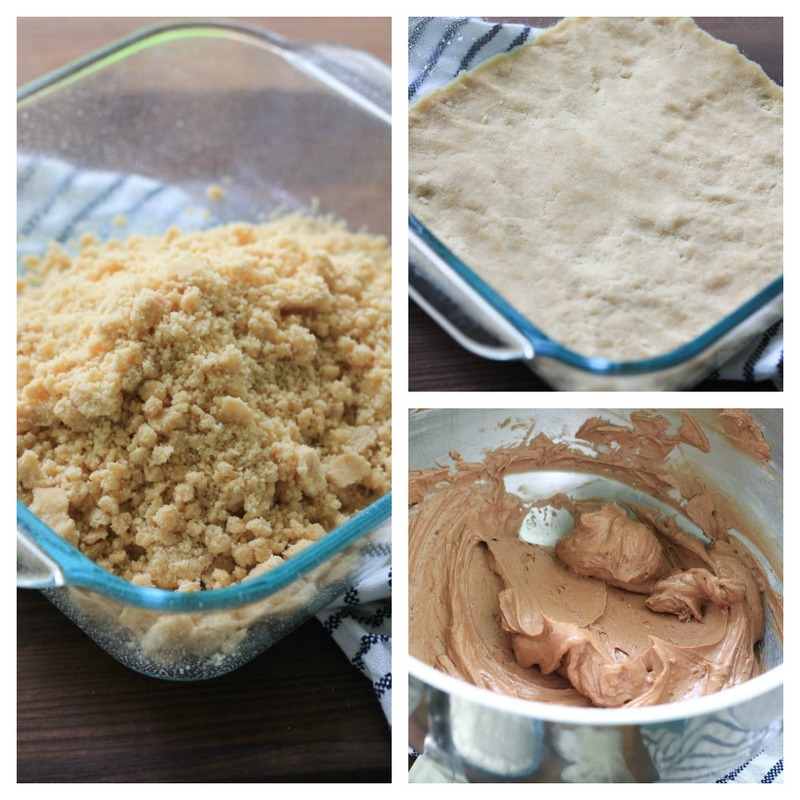 Pour batter onto cooled coconut flour crust and place in oven for about 25 minutes, or until bars are set in the middle. Allow to cool in fridge for 3-4 hours minimum. 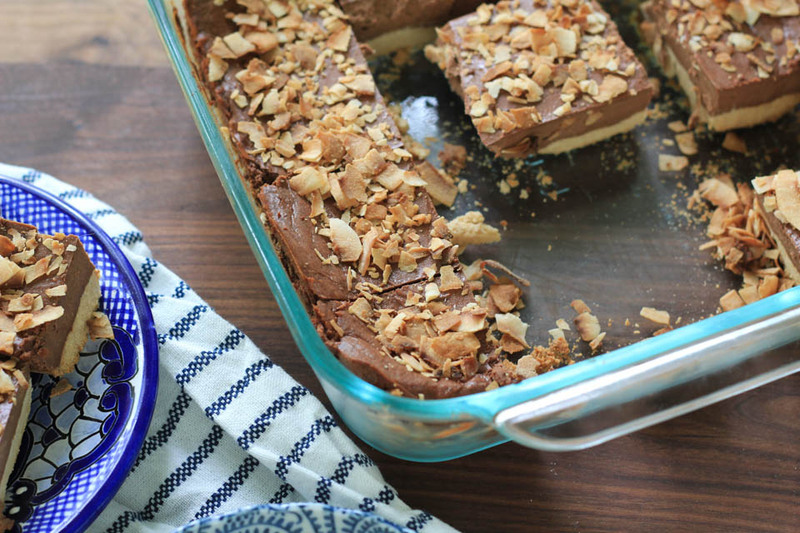 While bars bake, place unsweetened coconut flakes on a parchment lined baking sheet. Once bars are out of the oven, place coconut flakes in oven for 3-5 minutes, until lightly golden brown. Keep an eye on the flakes and careful not to burn. Remove and allow to cool. 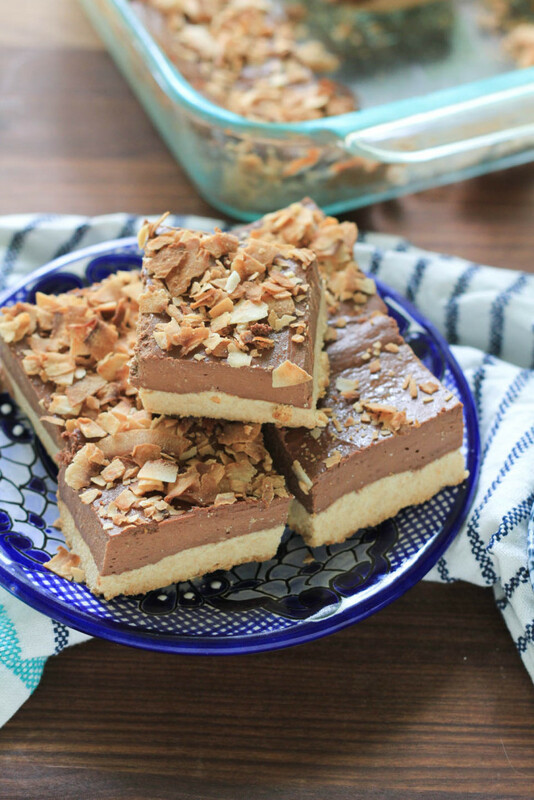 Remove bars from fridge and cut into 12 squares, then top with toasted coconut, enjoy! Keep in an air tight container for up to 5 days in fridge. More tasty recipes with Bob’s Red Mill! These are a gorgeous and tasty little bar! Love the coconut flour crust but really digging the cream cheese topping! I could eat these all day long. I love chocolate cheesecake bars, and cheesecake in general. Plus you used coconut which is my favourite thing in the world. I adore Bob’s Red Mill products, we can actually get them in Canada which makes me super happy. That is so awesome, they are the best! Can you please make all the bars because I need them RIGHT NOW! This is so totally my kind of dessert! Looks so good!! Oh, boy, these bars look irresistible!!! 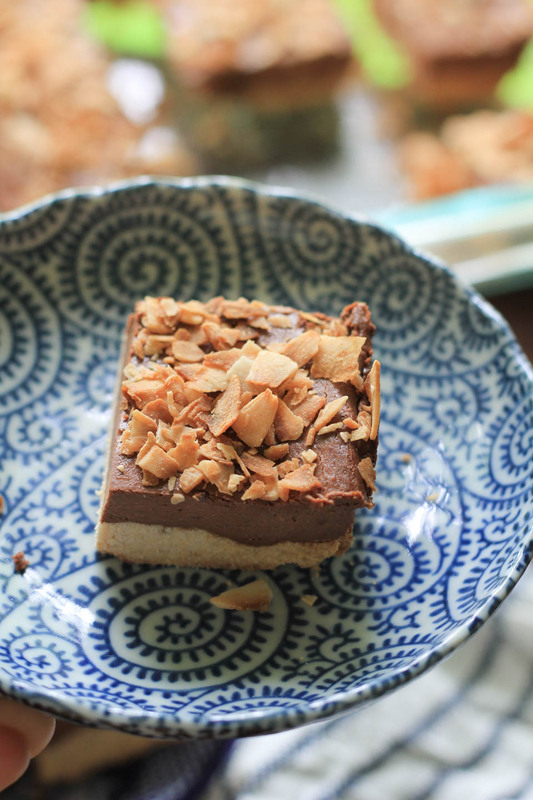 I love the combination of chocolate and coconut! Me too, they are so great together. Thank you!